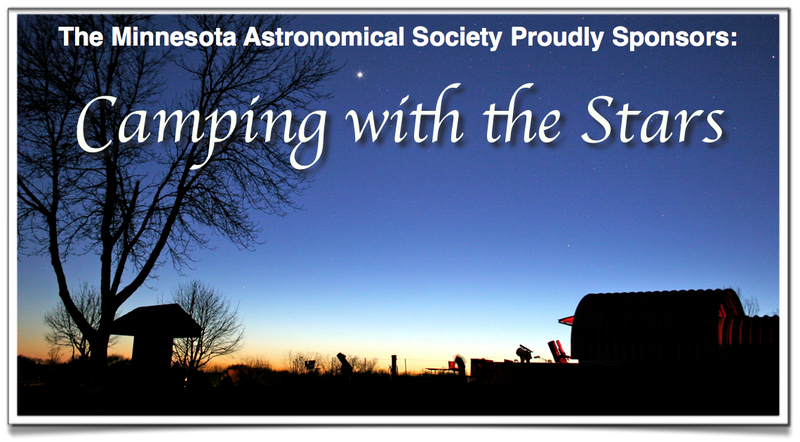 The Minnesota Astronomical Society invites you to the 6th annual Camping with the Stars taking place at the Eagle Lake Observatory, located within Carver County Baylor Regional Park, about 45 minutes Southwest of Minneapolis and 3 miles north of Norwood-Young America. For additional Information on the MAS Eagle Lake Observatory, visit the Eagle Lake Observatory webpage. Eagle Lake Observatory consists of the Onan Observatory, the Sylvia A. Casby Observatory and the HotSpot Classroom. Each observatory is handicap accessible, state-of-the-art facilities with robotic telescopes ranging from 4 inches to 20 inches of aperture and are ready to show you the skies. Come see the stars through our four telescope platforms that include a 14” and 16” Schmidt Cassegrain telescopes, 8 ” TMB design refractor as well as numerous other telescopes or sit back and enjoy live video of planets, star clusters, galaxies and nebula on the observatory imaging system. Enjoy a tour of the sky by one of our dedicated volunteers or bring your own telescope. There will be talks, prizes, solar viewing, and fun activities throughout the day and into the night. of any school or non-profit educational organization.